Councillor Geva Blackett has organised three free festive lunches in Deeside. A Deeside councillor has created three festive-themed community events with a little help from the Queen and leftover food. Geva Blackett has organised three free events for the “lull” period in between Christmas and New Year but needs more people to come forward so nothing goes to waste. 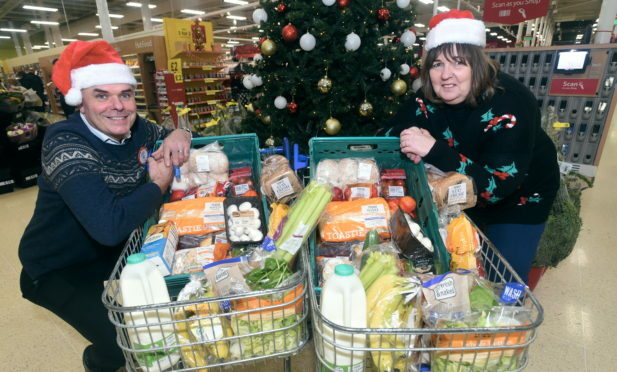 Two hinds of venison have been donated from both the Balmoral and Invercauld estates and the Tesco stores on Lang Stracht and Banchory will be providing spare turkeys and fruit and vegetables. Mrs Blackett – who is expecting just under 300 people – said the events were very much a “huge joint effort” from across Royal Deeside and scores of volunteers had come forward to help her out. Spotting a need for a community get-together, Mrs Blackett applied for a £1,000 community grant from Aberdeenshire Council. She said: “There’s always a bit of a lull after Christmas. Tesco’s Lang Stracht store manager Fraser Wenseth said he was “more than happy” to help and added: “We already use the food cloud app to give away our spare food to charities – CFine are one of those who are registered. “On Christmas Eve we will give Geva all our stock that is just about to go out of date – fruit, dairy products, vegetables and bread – and our spare turkeys which were over ordered for our staff party. The first lunch will be held in Lonach Hall, Strathdon on Thursday. on Friday, there will be lunches at Aboyne’s Victoria Hall and the church hall at Crathie. All three start at 1pm. Spaces are still available – call Mrs Blackett, who can also arrange transport – on 07876 475269 for more information.